Today was one of those bad-hair days for the beleaguered, no-renaissance manufacturing sector in the US. Bad-hair day because it wasn’t terrible to where you wanted roll up into a fetal position and hide under the table, but it wasn’t good either, just the kind of crummy disappointment we’ve seen more or less for years. And if we ever sit down and wonder why this economy “feels” so much worse than the overall economic numbers, lousy as they are, we need to look at some of this data on a per-capita basis. Because that’s what each individual really feels. If you have a bigger pie, but you slice it into more pieces, each piece might end up being smaller. New orders for manufactured durable goods, adjusted seasonally but not for inflation, fell for the third month in four, down 1.8% from April and down 2.2% year-to-date from the same period a year ago. Excluding transportation, new orders for “core” durable goods rose 0.5% from April, but fell 1.3% year-to-date. Excluding defense, new orders fell 2.1% from April and were down 1.1% year-to-date. OK, aircraft orders got whacked, and they’re big and volatile. So non-defense capital goods excluding aircraft – a category that covers everything from farm machinery and computers to institutional furniture – is an important measurement of business spending, and it showed what businesses have been doing for a while: they cut spending. While orders inched up 0.4% from April, they dropped 2.6% year-to-date. But here is the problem with how this economy feels for individuals: the US population has grown every year, even during the worst economic slump since the Great Depression. And this already weak economy looks a lot worse when projected on a per-capita basis and adjusted for inflation. Turns out, durable goods orders per capita and adjusted for inflation are now 36.5% below the 2000 peak! 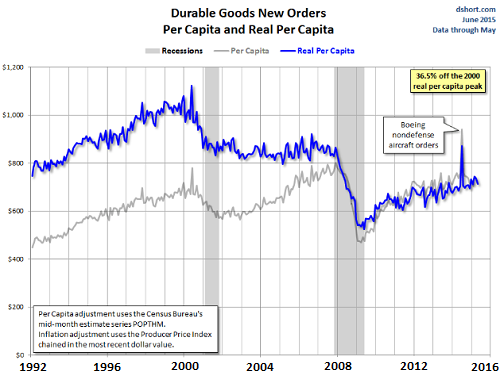 These per-capita durable goods orders dropped sharply during the recession of 2001. It was logical. Businesses slashed capital expenditures and operating expenses, and it rippled through the economy. But during the recovery, when businesses and consumers began to boost their spending, they didn’t boost it enough to make up for population growth. Nominal durable goods orders before the Financial Crisis were higher than ever before. But adjusted for population growth, they’d grown in a painstakingly slow manner and never fully recovered. And adjusted for both, inflation and population growth, they remained flat, and there was no recovery at all before the Financial Crisis hit. Then during the Financial Crisis, per-capita durable goods orders fell off a cliff, but recovered in the same anemic slow manner as during the prior recovery – despite or because of the totally insane amount of monetary stimulus the Fed has drowned the economy in. And thus, the “recovery” of durable goods orders on an inflation adjusted per-capita basis remains a sad joke. This step function will repeat itself when the next recession comes. And it will come, unless the Fed has finally succeeded in totally controlling every aspect of everything. When it does come, we already know what will happen: per-capita durable goods orders will react with a sharp drop-off followed by a weak and incomplete recovery, or perhaps on an inflation adjusted basis, no recovery at all.